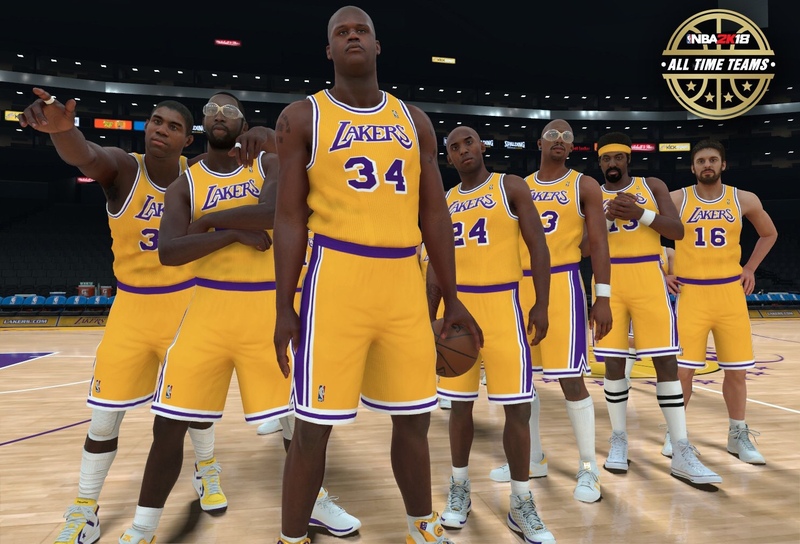 Today, 2K has revealed some of the players on the NBA 2K18 All-Time Los Angeles Lakers team. Magic, Worthy, Shaq, Kobe, Kareem, Wilt and Pau. OMG they fixed Shaq! Best he's ever looked! Wilt looks really improved! Also bald Kobe Yeah! Ok Showtime! I see you! too much greatness to process ... looks so much better than a Celtic picture . I was a little worried it was only 7 players, but Chris cleared that up quickly for anyone wondering. "#NBA2K18's "all-time" teams will have 15 per roster. Who are the other Lakers not shown in that pic? Also, what's your roster predictions?" Wheres Lonzo? :y11: Looks great, hopefully all of the teams are that quality. If you look closely you can see about 4 other players hidden in the background. Wilt, Kareem and Shaq, who do I start!?!? 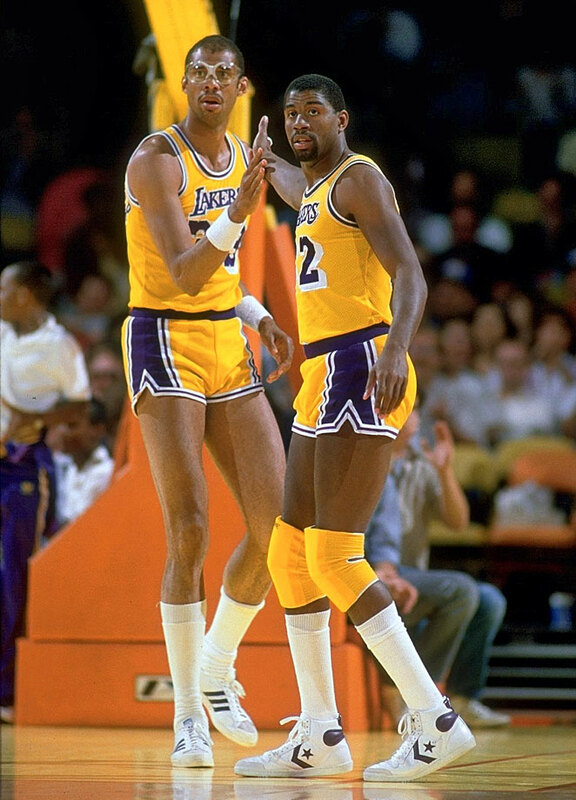 Seeing Magic and Kareem and Wilt in long shorts like that is just such an eye sore. Just an FYI, every #NBA2K18* All-Time Team has a 15 man roster. That's just half of the Lakers roster, still want people speculating on rest! 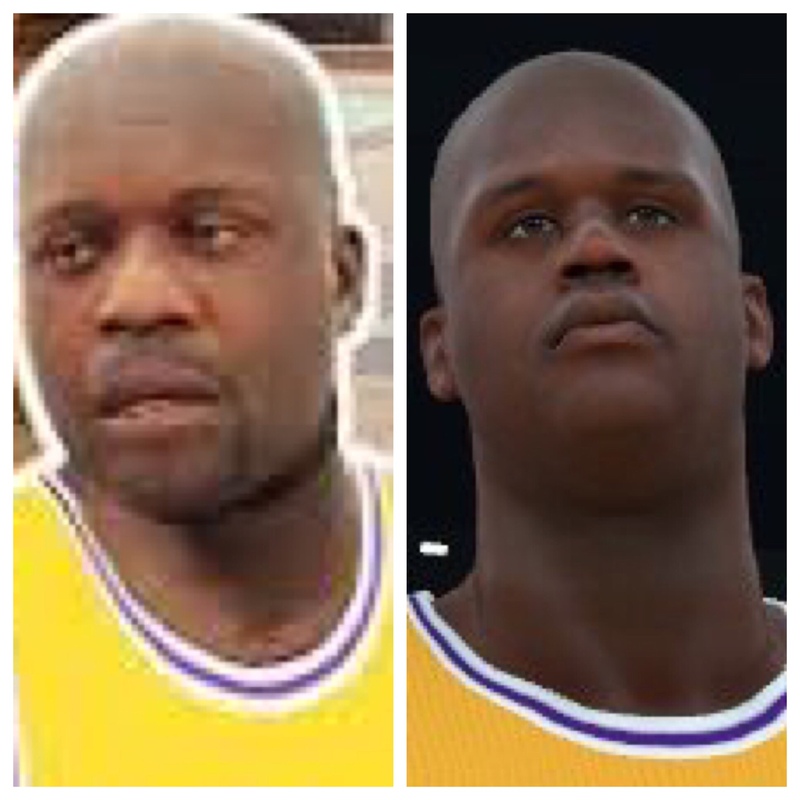 The fact that they fixed Shaq gives me hope that theres a chance they fixed Jordan. They have the best player of all time looking like a strung out crack head who begs for nickles in Penn Station in New York City. "Can you spare a nickel man ..."
Shaq looks great! They put my worries about his body design to rest. It also looks like they've worked on Wilt's face a little. looks fantastic, so do all-time teams for all nba franchises look this good? Wait no DJ Mbenga....2K has dropped the Ball on this project sorry!! I'll be curious to see what the rest of the lineup looks like. Could be sort of telling. I'll be most curious if guys like those last three find their way onto rosters. Or if each team is just going to be a composite of players already in the game. For the Lakers, that mostly works because they have classic teams included that cover most of their franchise's greats. Could get tougher for other squads. 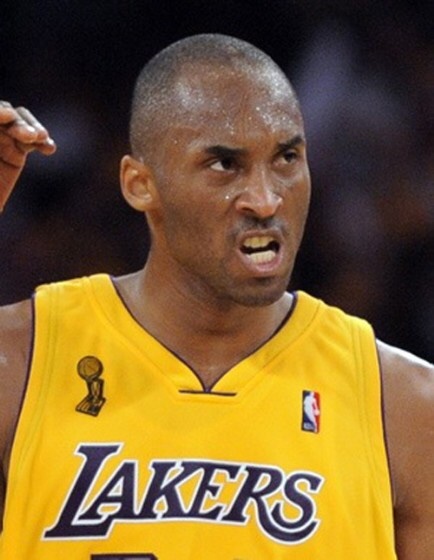 One, I'm a little upset that Wilt is on the Lakers. He played only 5 seasons with LA and he only had one truly elite Wilt-like year with them. He should be on the Warriors where he had that crazy 50/25 year. All will be forgiven if there is a younger looking version of him, with the pencil mustache and low caesar from the "100" picture on the warriors. I'd also love to see a younger, more athletic looking Shaq on the Magic, and possibly a washed, heavier version on the Heat. Since the All-Time teams are such a suspension of belief anyway, I understand why those guys have the same shorts length as everyone else. But I agree theoretically. It'd have been cool to see each player in their complete prime appearance (proper shorts length, Magic's blue knee pads, etc). The other day someone suggested that each player should be wearing their real jersey for their all-time team. I think that would have been pretty awesome. But I suppose it also could have posed issues for the teams who've changed color schemes over the years (one Laker wearing baby blue while everyone else wore purple wouldn't work). I think the angle of the photo (from floor level looking upward) makes him look pretty dopey; way dopier than usual anyway. But I think the takeaway is that his body shape and face look like they've received some much needed attention, giving hope that he might not look like a pear anymore. I'd be interested in seeing a more standard photo of his face. Pretty good. But Kareem needs to be slimmer, and I'm not sure about his face, might need some hair. Overall looks nice, but where are the rest of them? And shorts...? I think each player needs shorts for the ear they played in. Also, nice low Adidas for Kareem! Nice touch. Don't think it'll matter much, it's a fantasy team. You could always check to see if you can trade guys like Magic though for the other Magic on one of the classic teams to at least fix some of that. Pau is a Laker great??? I think it's a pretty safe bet that a number of players are going to pop up on multiple All-Time teams. Elsewise it'd really throw the whole idea out of wack. You can't have an all-time Lakers team without Shaq. You also can't have an all-time Magic team without Shaq. As you said, the hope is that each version reflects their proper appearance at the time they were on that club. If each roster goes 15 deep (as confirmed by 2K), I think Gasol could make a case, particularly if 2K struggled to secure any of the "extra" greats like George Mikan, Jamaal Wilkes, etc. Three all-star appearances as a Laker and two championships that would not have been possible without his acquisition. Averaged 19 and 9 on 60 percent shooting in the 2009 Finals. Pretty good. Prettyyyy, prettyyyy, pretty good. Weird that I'm noticing more imperfections. Like I know for a fact Shaq's hands are much bigger than that. Leads me to believe that one of the Kobe/Gasol teams will be included as a classic team. I'm guessing it's not possible for 2k to give each individual player different sized shorts. But if they all have to wear the same sized shorts, they should at least give em the 90s shorts that are in 2k17. It's a nice balance of short but not too short, baggy but not too baggy. It's gonna be tough to play with magic or Stockton wearing ginormous shorts. Was hoping they'd have everyone wearing the jerseys from their eras but it's all good. Awesome! Kareem is back, Shaq looks better and Wilt is there (you never know, 2k could lose the rights to certain players any moment). Hope they didn't just touch up Shaq. The shoes are a very nice touch, very specific with Magic wearing Converse, Kareem the old Adidas, Wilt the old Converse..Kobe with 24, I thought he wore 8 in his prime ;) Pau is not necessarily an All-Timer, but good enough I guess. How is he not? The Gasol trade was one of the biggest trades of the last 10 years of not only Laker history but NBA history in general. Plus it led to him and Kobe leading that team to 2 more championships. Damn right he's a Laker great. Parker, Gervin, Kawi, Timmay and the Admiral about to wreck this squad to be honest..
Kareem Abdul-Jabbar has never translated well to having long shorts. I know his arms look a little thicker than they should be but his short-shorts version has typically looked pretty good. It's just, when you throw on the knee-lengths, you lose that super gangly characteristic. Same thing happens when people create a long-shorts wearing Manute Bol. There's 15 players on the roster, just only a few were shown. Those two are locks. My first thoughts: (even before seeing the pick): I hope by default that these "all-time rosters" will rock short shorts regardless of era. My eyes can adjust to modern day player with shorter shorts, but throwback players rocking longer shorts just doesn't look right. My second thought: If shorts must be of common length, how about having both options available in the selection screen. Everyone with short shorts OR everyone with modern day shorts. My third thought: It would be great if we could edit short length, but I would prefer to play the game with default graphics that were done right. The less I have to fiddle with the better. My fourth thought: I can play with modern day long short roster vs throwback era short short rosters in 2k17 on the same court at the same time. What's the challenge in having mixed short on the same roster. I have plenty of respect for the Spurs but no way. We're talking about a team that has 3 of the all time greatest centers in Shaq, Kareem and Wilt. 4 if Mikan is in as well. Duncan and Robinson can only do so much ha. In all honesty I BasketballReferenced Pau Gasol to snag his Finals stats in '09 about five minutes ago and I was surprised he put in seven years in L.A. as well. Seemed shorter. I think your best hopes for the Nets' All-Time team rests in whether 2K added an early or mid-2000's classic Nets squad as well (02-03 or 06-07). In that case, hopefully that means they have the rights to guys like Jason Kidd, Kenyon Martin, Richard Jefferson, Kerry Kittles, etc. I still worry about the inclusion of other non-Julius Erving Nets standouts though. Derrick Coleman, Kenny Anderson (who may have been in 2K12's DLC), Michael Ray Richardson, Stephon Marbury, Keith Van Horn, etc. Sixth man Manu off the bench? Should be a fun squad to run with. I'm looking forward to the All-Time Celtics team myself. It'll be interesting to see the starting 5 for a lot of these teams. And yes players can be on multiple teams. Who starts on the most All Time Teams? That Magic squad will probably one of the most played with team. Aww man..guess that was inevitable. They better not exploit that though. I get that Shaq is probably on the Magic, Lakers and maybe the Heat (championship) but other than that, hell no! Jerseys look bad to me..and no excuses on these shorts. But glad they are upgraded bodies like Shaq and Durant so far. I'm sick of screenshots quite frankly though. Don't care for a trailer either. Want gameplay. What ever happened to those days where we'd just get 5v5 full quarter gameplay from multiple teams. Right from the company. I still say Kareem needs some hair, more of his mid-80's look rather than late 80's. My thoughts are, to hell with the shorts if we can get the legends looking right from face-to-body scans similar to these. Shorts can wait for 2k19 or beyond, let's get these legends looking right. 16 added classic teams and 30 added - All-time franchise teams... what's Kobe supposed to wear, long shorts while Wilt is in nut huggers? That would be an eyesore with everyone mismatching. So, are we getting just one version of each player? Would Shaq be the only one to have several versions? I would have the 1976-77 version of Kareem. Are we getting several versions of each player, or it's just one no matter how many teams his on? Most these lists he's posting been ***. Lol Matt Maloney though? no way does he belong on an ALL TIME team. This, it always bugged me when a guy like Tracy McGrady Magic years (in UT) would be the same as his old Rocket model, which was the same model as his last year in 2k. Definitely hope they tighten that up. I can't use wrong year players for their teams they are suppose to be the Stars of. Anybody adding Luis Scola on an NBA Classic team gettin' a 2-Piece on sight! I doubt it. I mean 2k17 had 2 versions of Pippen, 2 Horace Grants and a bunch more so I'm sure they will do everybody justice here. Those are probably the same versions of them too. You know how 2K is sometimes. They more than likely just took Kobe and Pau from either the 2009 or 2010 team and placed them on the All-Time team. I'm willing to take Mobley and Horry off but Francis was the Rockets for a good while and deserves that recognition. Most people remember Rudy as the coach of the team more so than playing for them so he should be in but as the coach imo. 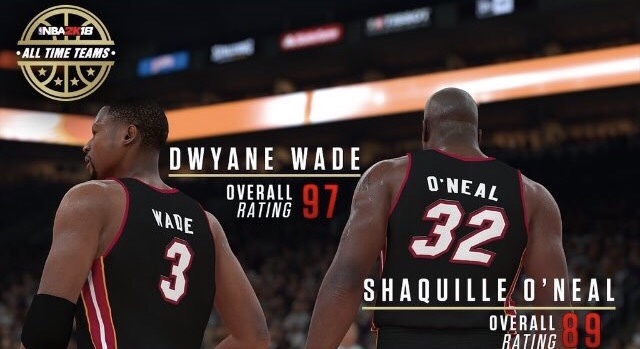 If 2K supposedly can make any custom bodies with their new engine, then there's no reason why there should be one version of Shaq. 23-24 year old Lew Alcindor on the Bucks is a whole different player from the Lakers' Kareem (especially from the 40 year old one). However, I'll give you the coaching thing. He'll need to be the coach and having him as both would be just weird unless 2k is gonna do the generic coach thing, then Rudy T over Franchise for me. Calvin Murphy, Ralph Sampson, Rudy T, Leavell, John Lucas and McCray / Newlin. A case could be made for Maxwell & Kenny maybe, but Lucas, Francis & Calvin over Kenny + Harden, Drexler & T-Mac / Leavell over Maxwell. I can't stand seeing the legends of the 70s and 80s wearing those long shorts. It just doesn't look right. lol come on man. First names made that kind of confusing for a second. Not to mention you not putting the team. Should Kenny really be in over Francis though? I mean he made some key shots in the Finals but he was never really an elite player. Again- please use this thread. 1. Contributions to a title. 2. If the player did not win a title or the franchise doesn't have one then longevity and personal accolades with that jersey on. 3. If they had no personal accolades then longevity and ranking in various franchise statistical categories. I hope "Elite" status isn't all they consider in making the teams. PG13 could be an Elite player for the thunder this year and then move on. I hope they take into consideration franchise contributions, longevity and just meaning to the franchise. Idk If Steve means more to the Rockets than Kenny. Kenny got there and average 18ppg but didn't win and after that he was a 10-14ppg scorer but started and contributed to the 2 titles. Idk thats a tough one but I think the titles will put him over the top. What season Steve Francis did we get last year? I can't think of it off the top of my head. That T-Mac/Yao team. Love how size difference is really pronounced. Hopefully this does some wonderful things for the gameplay. Pau?? Lol no.. maybe on the all decade team. You're selling Pau insanely short. He doesn't crack a 15 man all laker team ? Doesn't all star team up have everyone with correct shorts length? Should be doable, right? Ill rarely or never play with these all-time teams, but this screen got me very excited for a couple of reasons..
1. Shaq. Can't wait to use an accurate looking Shaq with la, Orlando, Miami. 2. Prime Kobe. I know everyone saw his coming, but nice to have confirmation. 3. More retro shoes added. Loved edited classic teams with accurate gear. This is a brilliant idea from 2k. They basically just edited a roster and marketed as all-time team. Prob didn't take too much time to implement and it got a lot of ppl excited. Really hoping they touched up some legends, and either added some big names or really upgraded CAP system. That was what I was thinking. I'm thinking it might be these Indiana players based on the My Team cards. Pau definitely deserves to be on that team. Was the biggest trade in recent Laker history that led to championships. Heck, he's probably the best Power Forward the Lakers ever had. Pau will be a HOF and will have his jersey retired by the Lakers once he is. He's an all time Laker. The same Pau that is the primary reason the Lakers won those other two rings? that's just not good enough to me. They need to get Miller and Oneal. Well, as I've posted and requested several times before - you should be able to edit the shorts from player to player because not every guy wears their shorts the same. Classic or modern era it shouldn't really matter. If you look at it today, one player will wear them longer and baggier while another player will wear them shorter. They need to give us the ability to do this IMO. This needs to be an option across the board. So anyone else low key just excited to see Shaq is ACTUALLY HOLDING THE BALL and not using the force. Always been a pet peeve for me. Yea, I can't speak to that since I'm not a programmer. If anybody with any knowledge could chime in? I know they have adjustable sock length. You can even have your socks pulled up or bunched up. The short-shorts assests are already in the game as well. Edit: It probably has more to do with the art team having to make 3 different sizes of the same shorts and not having the time/resources to do it? They'd have to render 3 pairs of Lakers shorts for just that era of uniform and so on. Short, Medium, Long etc. The art director from Madden kindve touched on this with regards to team specific helmets in the pro bowl. It's pretty hard on the gpu to process different art assets like that all at once. Im guessing shorts would be pretty similar. And I understand it's been done in previous systems, but with more detailed crowds and player models, the systems are maxed out a lot of times. I wish they would just use the shorter shorts from the 90s instead of these capris. But it's a pretty simple fix to do it ourselves by editing the rosters. Webber played one good season for the Warriors. I don't think he should be in. Also. Pietrus? Where's Wilt? Steph? Hell even Klay and Draymond could make this at this point. Yea there's no way 2k wont include Steph and Klay At-least. Draymond? I hope not. I can see that. I'm speaking more from the perspective of a MyCareer guy who doesn't want my player to be locked into wearing huge 2001 Allen Iverson shorts. I don't wear shorts like that in real life so it's a little bit of an immersion killer for me. I also know the value of being able to adjust this for Legends guys too, so hopefully they were able to work something out this year. Based on the screenshots released so far through, it looks like everybody has the same cut of shorts though. We haven't had too many 'all time greats' over the years. Outside of Run TMC and the current team. Dray is pretty damn good. But I can understand him not being in. Gotta have Barry and Nate Thurmond. Both were last gen DLC. Regarding the shorts. So, will the old teams like 60's Boston, 80's Lakers etc still have their short shorts like they do in 2K17? If so, why can't they just take those models and put them on the All-Time rosters? I'm assuming you're a Bucks fan? Didn't they draft D.J Wilson from Michigan this year? He's well known for wearing his short shorts. You know dang well 2K won't have that in the game. Again, you poor Buck fans get the shaft. Lol. Really too bad though because that just adds to the authenticity. The Warriors DPOY can't be on there? Are those convers weapons on magic this year? No weapons on the game last year, so happy to see them this year. I may be doing rosters again because of these extra classic and all time teams this year. Good point. Thurmond and Barry have to be in there. But I also think Steph and probably Klay have to be included as well. There's a few on his list I would remove for them. Weapons were 100% in NBA 2K17. There were even Magic Johnson and Larry Bird PEs. Actually the weapons were in the game this year. But only certain players had access and the colors were messed up for Isaiah Thomas. I noticed Kareem has old school Adidas on which is definitely promising. I am. DJ went and got braids in his hair now too. Bucks are always looking 2/3 seasons behind. I'm just glad they kind of fixed Giannis from last year. It's definitely possible to have different shorts lengths for players on the same team. Look at Magic and Worthy here. Might want to mute the vid. These young fellas gonna be changing their hair up off and on throughout the season lol. 15 man roster, yeah probably. But not deserving to be standing up front in that picture over Lakers legends Jerry West, Elgin Baylor, George Mikan. But we need to edit shorts lengh in the near future. Pietrus, Jamison and Hill should never make it. Jamison should be on the Washington team. or a hungry african smh. His airness cant get any love. Thats why I hope they will give us the option to edit these nba shorts. Where are my boys Jerry and Elgin? Lets hope those 15 man roster does not have any John Smith of the world at the end of the bench of those all time teams. It's been confirmed on Twitter that all of them will have full rosters. It would be silly to do it otherwise. Also with the NBA expanding to 17 man rosters (technically) this season, why can't we get 17 man all time teams?! Haha. A guy can dream. Haha, Byron Scott -- and maybe Rambis, for sentimental reasons -- arguably actually deserve to be on the all-Lakers roster. Earl Jones (look him up) is an old-time DC legend who busted as an NBA first rounder in the early 1980s, and is unfortunately a punchline in LakerLand. Shannon Brown had ridiculous hops, but didn't he kind of disappear from the league? I'm all in for Pau to be Lakers all time great. The trade that sent Brown to MEM, was the turnaround for LA. If only they didnt take DAL lightly (give credit to Nowitzki's incredible performance), the Lakers may have faced MIA and who knows, going for the 3rd title? If 2K could add Odom and Fisher back to the classic roster, I'm definitely running the two teams to ensure they meet in the finals in myleague. I'm just disappointed that the same 2K17 Pau was used. He just look ... not like him at all. He has long fuzzy hair back in those days. Wow, they still have the wrong number font for the retro unis and it's been like this since 2k15 come on 2k fix you game! The Cavaliers version of Walt Frazier fits perfectly into those "Players who look weird on any other teams" articles. I had to run a search for "Frazier" on Basketball Reference to see if you were referring to some other mystical Cavs talent from days gone by. True aha the Cavs didn't even get a full season's worth of games from 3 seasons but no doubt he's on the NYK roster, it'd be easier for VC to include him in CLE too. It's not like we've had a history of Hall of Famers. I love that the Lakers squad is wearing their iconic Showtime era uniforms. I hope 2K continues that trend and have franchises wearing their best/most famous uniforms. I was hoping for another all time classic team revelation today. What happened? I thought the Celtics were gonna be next just to represent the most important rivalry of the sport, now that the Lakers have been announced. So what is the schedule for the all time teams? I really hope they give Magic, Wilt and Worthy the proper short shorts. Extremely strange to see them in modern length shorts. I refuse to use the Utah all time team and have Stockton in long baggy shorts. I'm kinda okay with the long shorts. When I drop them in MyLeague I'll be using one of Magic's Lakers teams for the franchise and they'll get short shorts by default but I get how people want to see the long shorts and short shorts players to have their shorts while on the same team. Jerry West, Elgin Baylor, Gail Goodrich, George Mikan, Jamaal Wilkes, and Michael Cooper. No Andre Miller over Mo Williams? 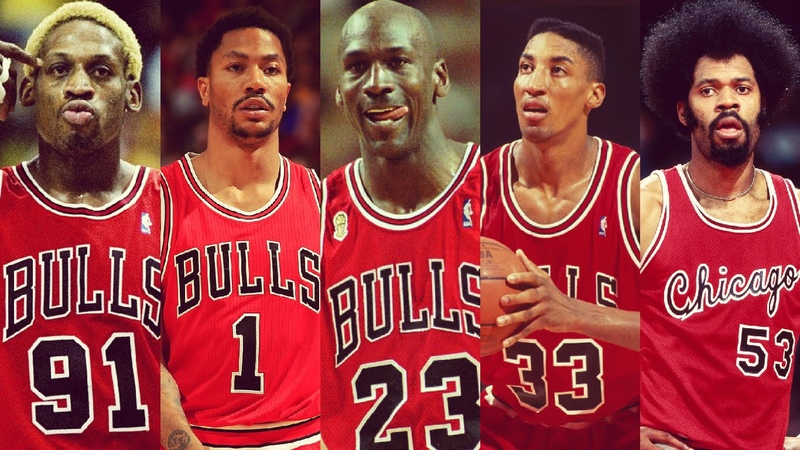 Probably the 2nd or 3rd best all time team in the game. I'd be veryyy tempted to put Pip at the 4 and start Butler at SF. 2. Ratings for all time teams are tough. Personally think Kobe is like 12-14 on all time list. Curious where a 98 puts him. Do I spy the return of biceps bands? Ben Wallace might finally end up looking like the real deal. Yeah, they're back. But didn't Kobe wear it on his left arm around 2002? Actually, I see photos on both left and right arm. Looks like he used to switch it back and forth...? Also I think it's needs to be yellow (home) or purple (road). Yeah, but if he's wearing the bicep band, I don't think he's supposed to be bald. Looks like the older Kobe with the younger-Kobe accessories. Good eye, should be Kobe with hair, as well as #8 Kobe. Kobe ain't a 98 though. I've never had him in the GOAT conversation. If all the All-Time squads were rated on the same relative scale, he's like a 95. He definitely shouldn't be a 98 if he's wearing that accessory (2003? 2004?). I'd like to see any reasoning to how Kobe's overall will come out at a 98 and the Heat LeBron not be a 99 on the same scale. Going to have to compare those attributes. I guess we can expect everyone in the top ten all-time to be a 99? 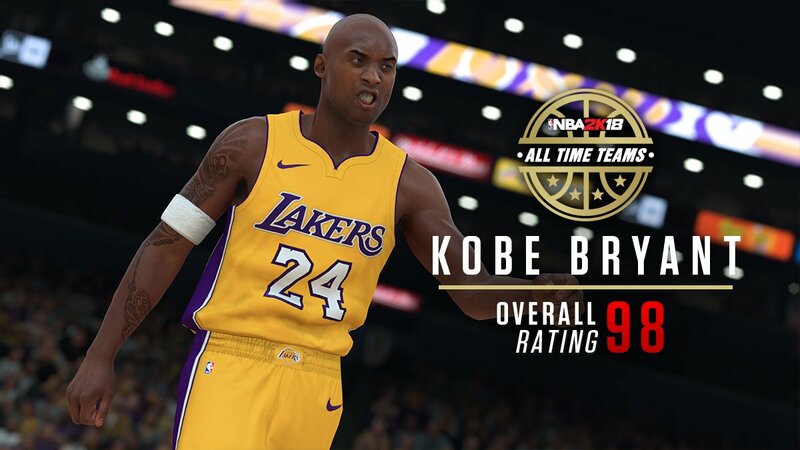 Kobe isn't a 98.... he is a 99! Agreed. He's a fan favorite though so unfortunately 2K probably felt pressure from the fan base. A lot of fans on Twitter/Reddit are actually mad that he's not a 99.